Two trains, a plane and a hire car! On Friday we are heading back to the UK for the Christmas holiday. Really looking forward to it. What I am not looking forward to is the day spent getting there! We leave our apartment at 4am (I shudder at the thought of this, trying to get two sleepy children dressed at 3.30am is no fun). We then hop on the the first train of the day – the KTX, this is a super fast (300km/hr, 190mph) train which gets us to Seoul Station in two and a half hours, the slow train takes just over four hours. We then transfer to the airport express, which is a short forty minutes journey. Fair to say, this is no-one idea of a fun day (though my husband is used to it as he does this at least once a month!) but add on a six and an eight year old and it is going to be a tough day. We have a couple of comics, Katrine has a stash of books and I am going to pick up some stickers today. The iPads are going to be invaluable and I am thinking of adding some new apps, any suggestions very welcome. And I have also loaded up the ipod with loads of audio books. But I think we are just going to have to accept that they, and I, will be bored for a good part of the journey. 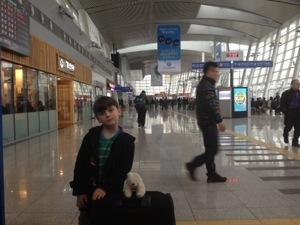 This is our first trip out of Ulsan as we hadn’t yet been we picked the capital Seoul. We are staying here for 4 nights, heading back to Ulsan late on Thursday afternoon. 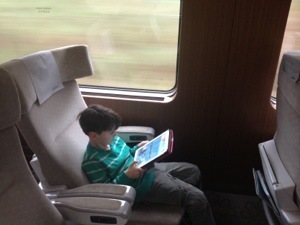 We travelled up on the KTX, Korea’s ultra fast bullet train. The station is about twenty minutes out Ulsan and we got a taxi for simplicity but we are going to try the bus on the way back. We arrived over an hour early, due to Richard’s very large margins for error; it might take us fifteen minutes to get a taxi and we might get stuck in traffic etc… but this was a very nice station to be early in. Introducing Marco Polo, Gregor’s polar bear – a birthday present from Aunty Lynsay, with the KTX station in the background. 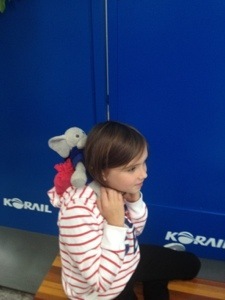 Katrine is being loyal and her faithful, and slightly worse for wear, elephant, Nelly, has travelled with us. The train, as you would expect, was very fast but I was surprised at how quiet and smooth it was. It is a very pleasant and stress free way of travelling. Here is Gregor in the over-large seats. We spent the afternoon wandering around the narrow streets of Insadong (I forgot to take photos but will get another chance), trying to steer the children away from the tourist traps, they are both complete magpies. They are tucked up in bed now, we have a busy day planned tomorrow, and Richard is preparing tea – Korean pot noddles!